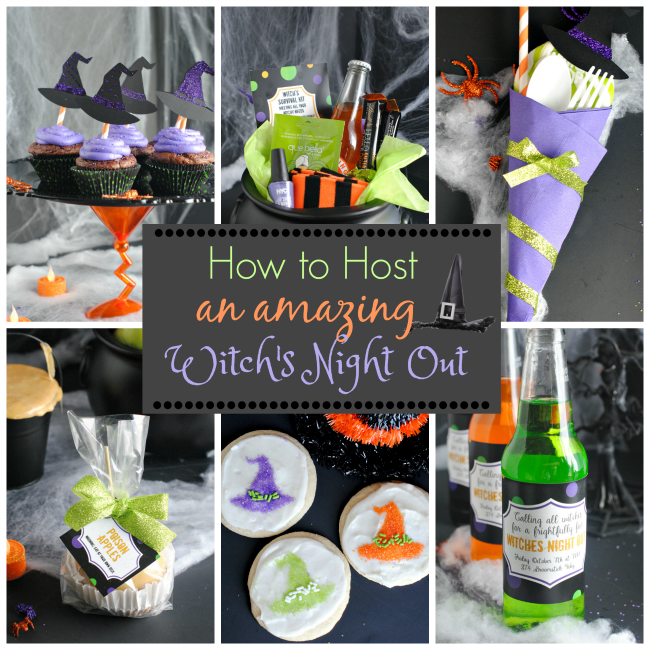 A Peek at the Fun: Thinking of throwing a Witch’s Night Out Halloween Party? We’re giving you everything to host an amazingly fun night out with the girls. Let the fun begin! 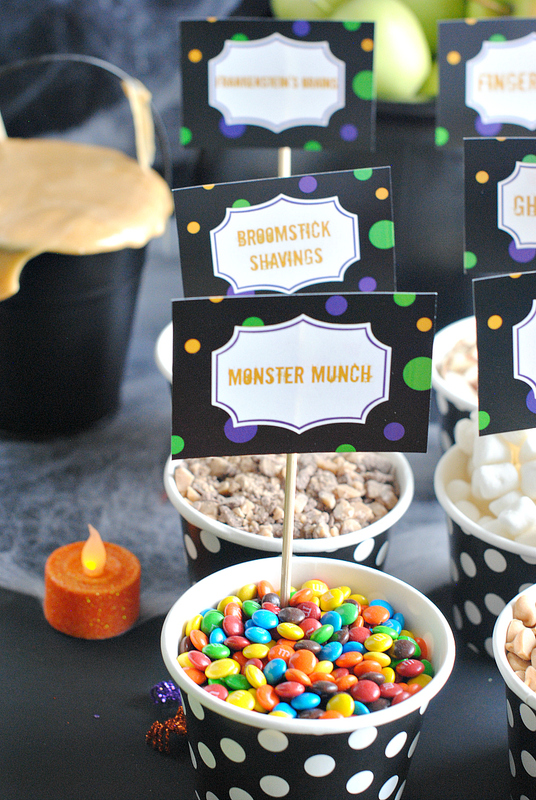 Grab your broomsticks, dust off your cauldrons and come learn how to host an amazing Halloween party. 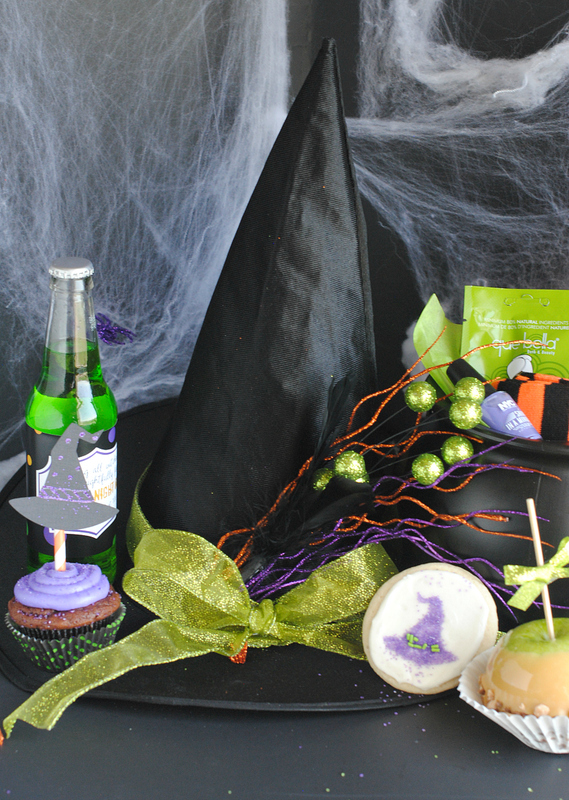 It’s that time of year where witches are loved and broomstick transportation is acceptable…so hop on board. 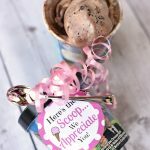 When the kids’ homework starts to pile up, the soccer schedules have us losing our minds and the household chores never seem to end, sometimes the Fun-Squared girls need a girl’s night out! 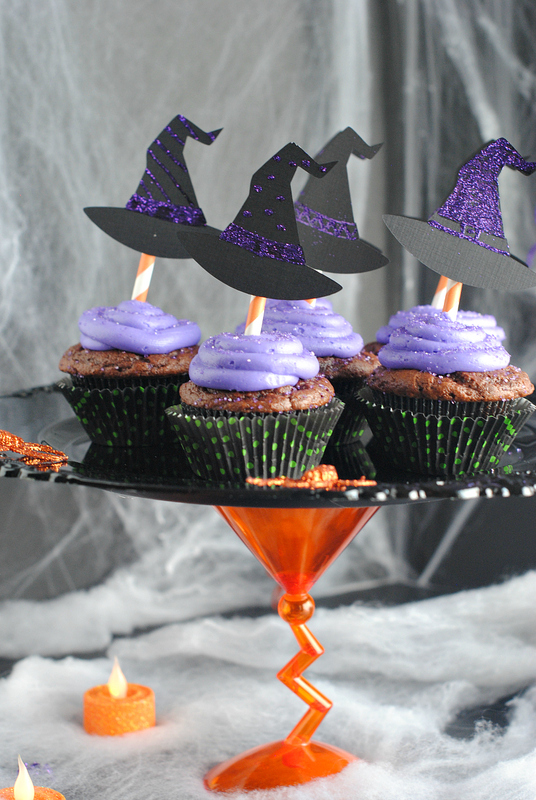 We’ll use any excuse to leave the little monsters at home, don our witch hats and spend a night laughing with friends. If you’re feeling the same way, we’re here to help you plan a perfect night out with the ladies. We’ll show you step by step how to host a fun night out with the girls-everything from invitations to decorations, and we’ll even throw in some food ideas. 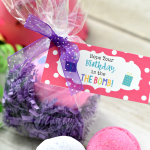 Invitations: Any good party starts with a fun invitation! This lets your guests know what to expect at your party and how amazing it’s going to be. Not just any ordinary invitation will do if you want to knock their striped socks off. You can always take it up a notch or two by thinking outside the box. Invitations no longer need to come in a stamped envelope on a flat piece of paper-the more creative you get with your invitations, the more excited your guests will be to come. 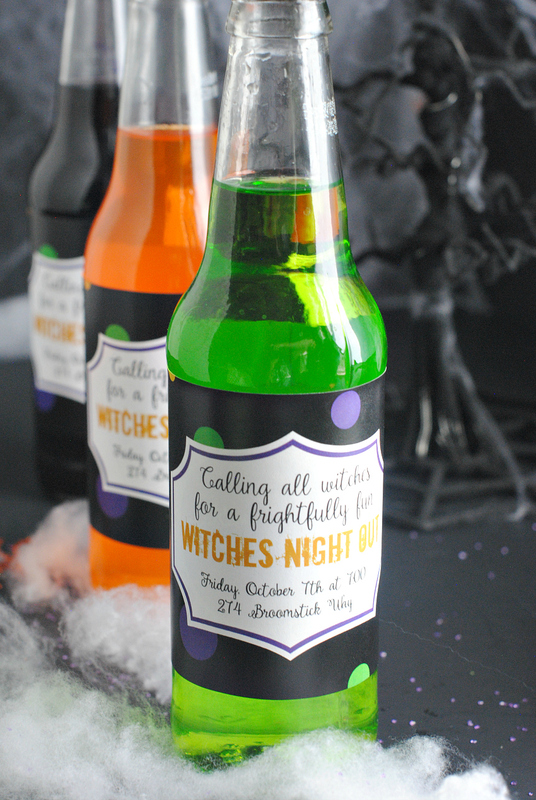 For this party, we grabbed some fun soda bottles that matched our color scheme and added labels with the party details on them. 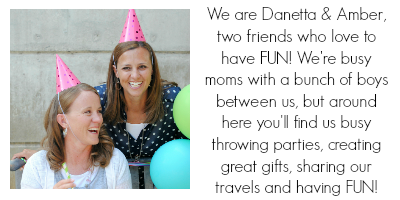 This worked perfectly for us because all of our guests were local and we could hand deliver the invitations. And…we have a free printable for you if you want to use it too! 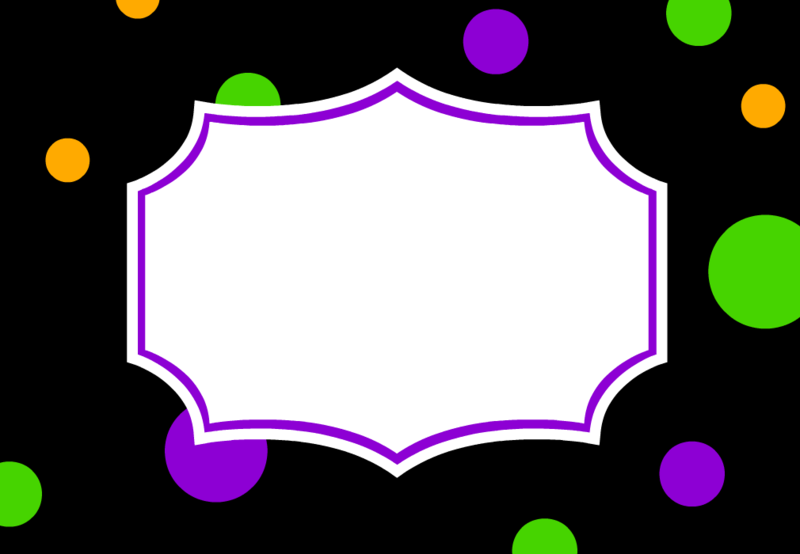 You can save it to your computer and then personalize it for your party! If you need help with how to do that, use this tutorial. 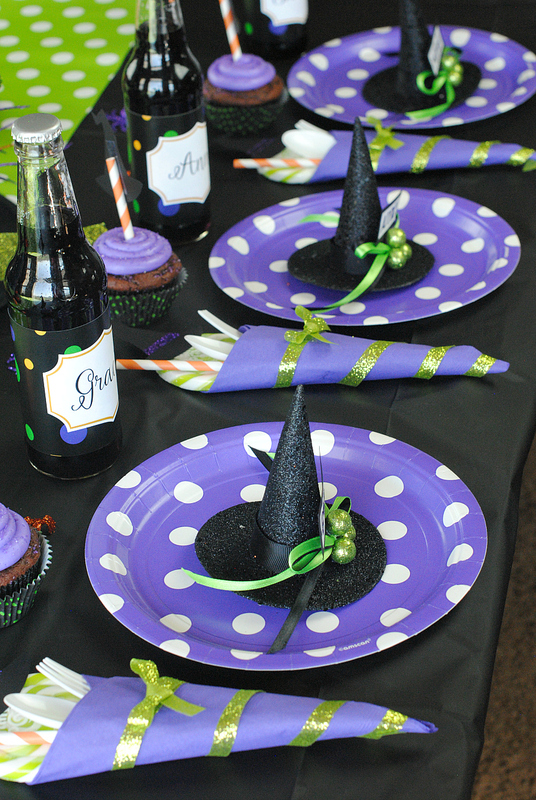 Witch Party Decoration Ideas: Step number one when planning a party is figuring out what colors you want to use. 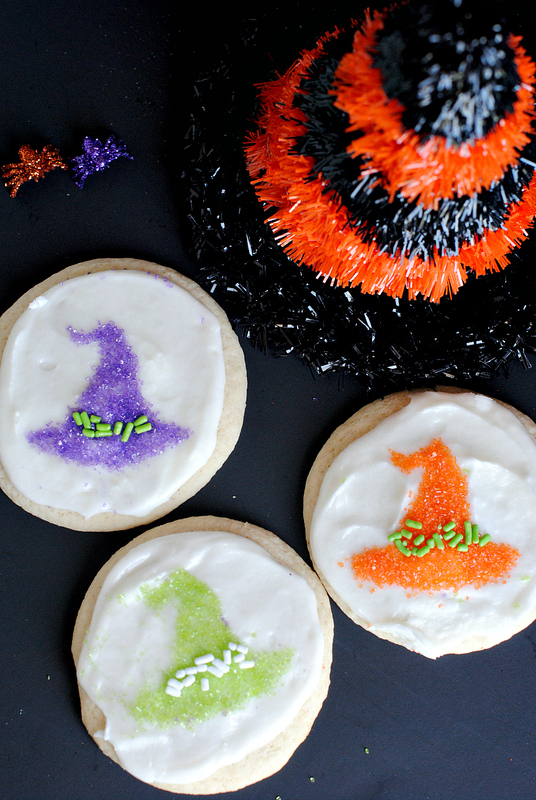 Since it’s Halloween, we chose green, orange, purple and black. Once you have that decided, everything else falls into place. Do you love that fun green and white polka dot table runner? Pro tip: it’s wrapping paper! Don’t be afraid to be creative with your tablescape. 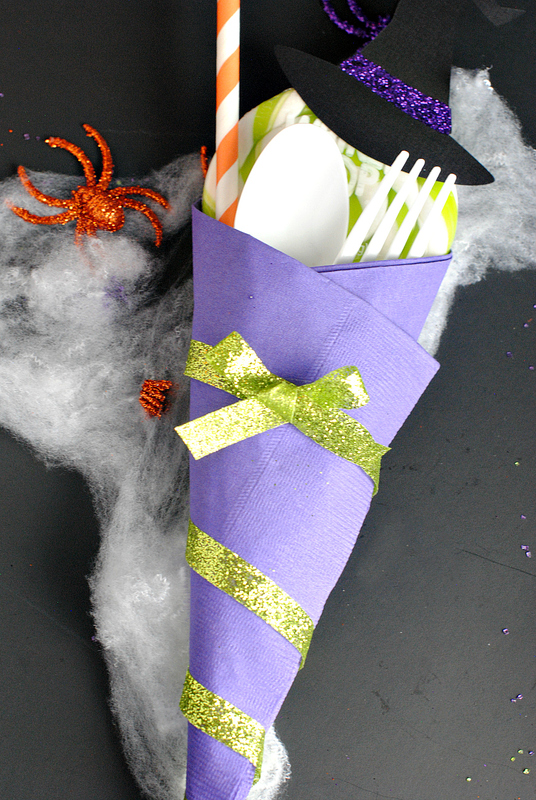 In the napkin bundles for our table settings, we added a cute lollipop topped with a witches hat, orange and white stripped straw and tied it together with fun ribbon. 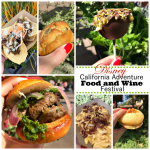 Food: Take a little time to think about what food you want to serve at your party. Do you want it to be a dinner? Do you want to just have treats? Some things to take into consideration-allergies, prep time, and cost. Every good girl’s night has chocolate and lots of it. Chocolate cupcakes are a favorite of ours, so we knew we had to include them. This recipe is one of the best recipes you’ll ever try-it doesn’t disappoint! 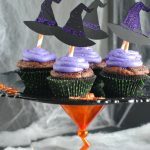 Then we simply frosted them with fun purple frosting, added some sprinkles and then topped them off with cute witch hats. 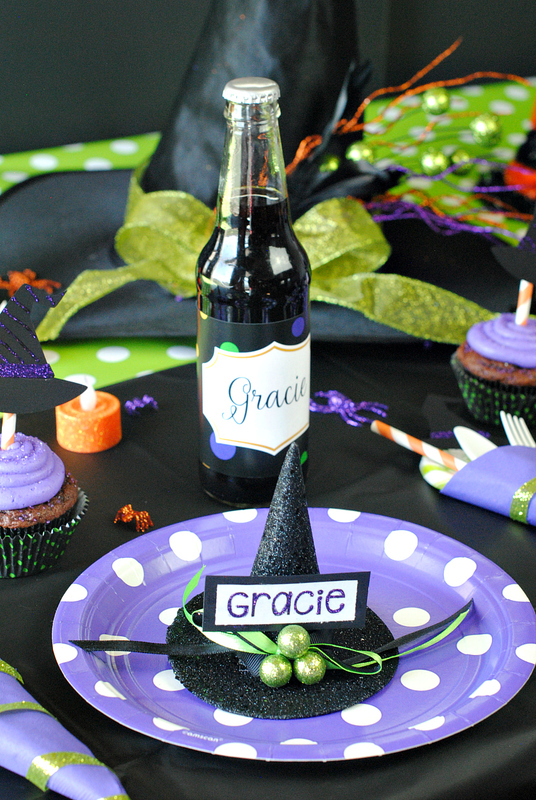 To make the hats we cut them from black card stock and then used purple glitter to embellish a little. We taped the hats to orange and white straws for an extra kick of fun. 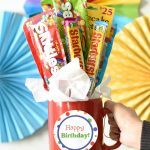 Check out our tutorial to see how to make this adorable cupcake stand…it’s so simple, you can make it in about 1 minute for under $10. 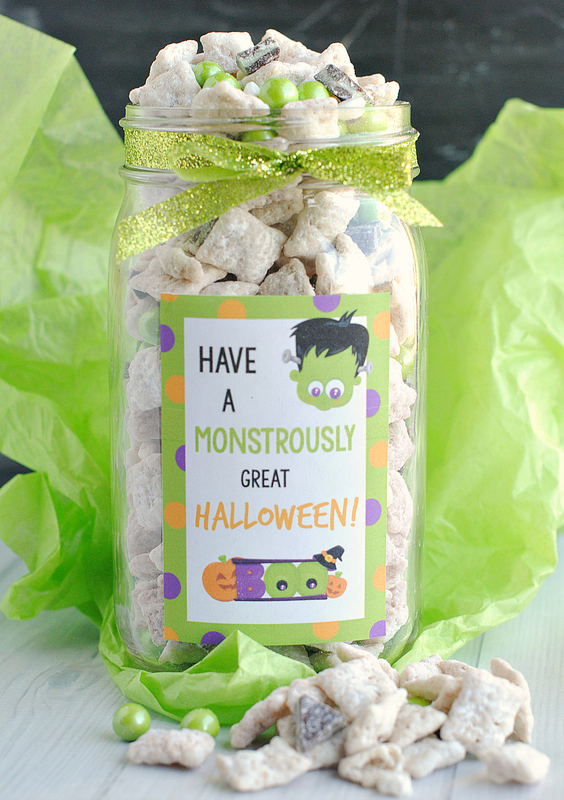 We love the idea of a make your own treat because it not only gives you great food, but also something to do at the party. This is a great time for your guests to have fun together, talk and mingle. 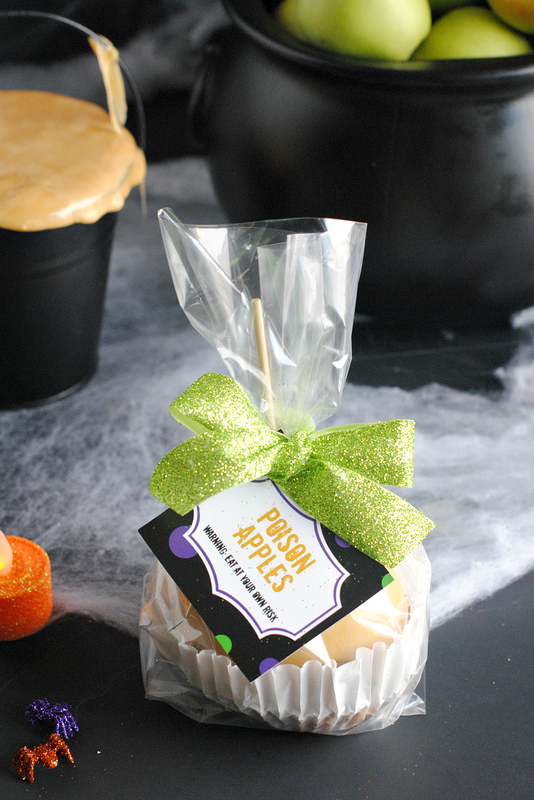 We know every witch’s story ends with biting into a poison apple, so we embraced and made this fun Poison Apple Bar. This also make a really fun take home gift. So encourage everyone to get dipping! Entertainment: What are you going to do at your party to keep your guests busy and having fun instead of feeling awkward? Possible ideas would include playing a fun and interactive game like Bunco or Bingo. 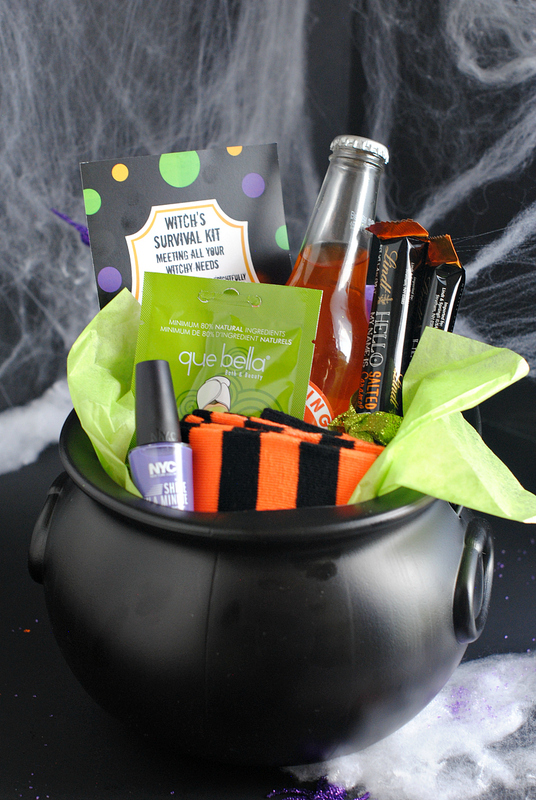 Or make it a fun spa night complete green witch’s masks, pedicures for witch’s feet and a manicure for those warty hands. Just keep in mind who you have invited and what they might enjoy and you’ll come up with the perfect activity. Don’t ever get overwhelmed by throwing a party. It’s supposed to be fun! Your guests don’t care if everything is perfect, only if they’ve had a great time! 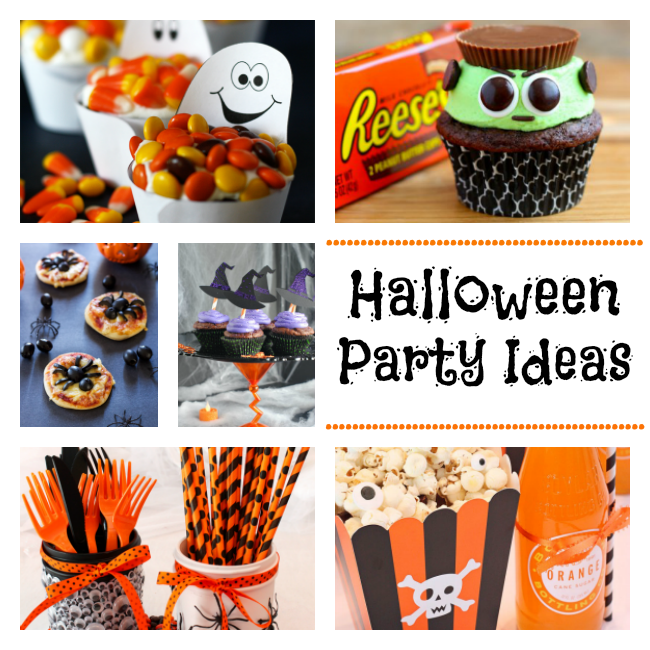 Here are some more printables that you can use for your party if you would like to use them! 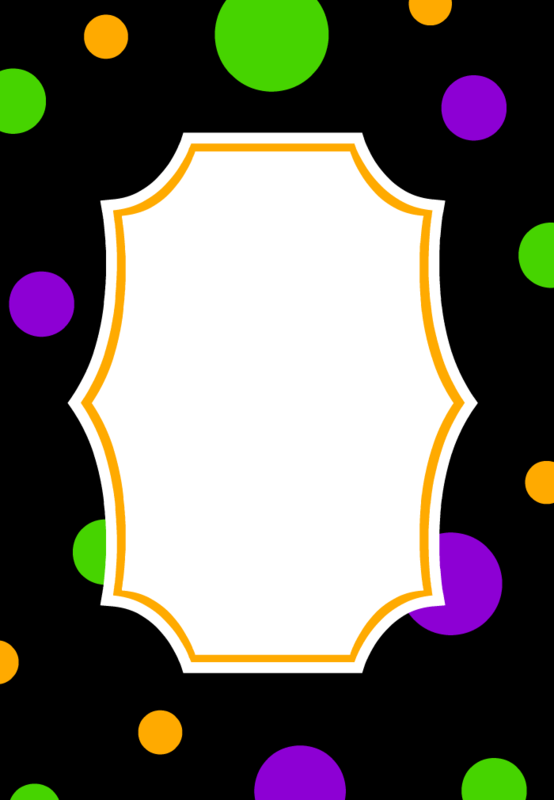 Use them for tags, place cards, invitations, whatever you need. Just right click and save them to your computer, then you can tweak them and print them. Here’s a tutorial on how to personalize them if you need help. 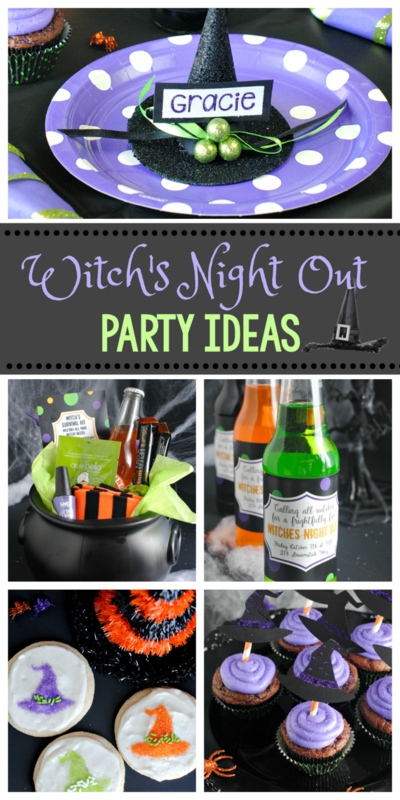 Have FUN throwing your Witch’s Night Out Party! Oh my gosh! What a fun party! I can’t wait to use these ideas! Wow I’ve had so much fun making some of these ideas thanks. Can’t wait to see our grand children’s faces on Monday.